Horseshoe welding is a good way for novice and intermediate welders to learn basic welding techniques. The shape of the horseshoe adds a unique dimension to craft objects. Make games, furniture, decorations and usable household items from one or more horseshoes. Horseshoe art is durable and interesting. Think outside of the box to create useful items that are more than decorations. The shape and durability of the horseshoe makes it the perfect item to use to build the frame of a chair. A square or rounded frame is made by tipping, tilting or lining up the top, bottom and edges of the horseshoe. A square frame is made by welding together the points and bottoms only of the horseshoes. The curved edges become the line of sight for the straight edges. Tilt the horseshoe and weld the curved edges together rather than the points or bottoms to achieve a rounded look. Make a jig if making multiple chairs so the shape is maintained in all chairs. A horseshoe puzzle is two horseshoes connected together with chain link. A metal ring is suspended on the chain link. The object is to get the metal ring off, then back on the connected horseshoes. The horseshoe puzzle is made by welding three chain links to the two points on one horseshoe then to the other. 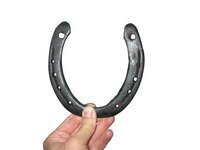 A 3-inch metal ring is used for a 4-inch by 5-inch horseshoe. The metal ring is welded together so it cannot be separated and removed from the puzzle. A jig works well for this project to make sure the chain links stay in the proper position. Make a series of coat hooks by welding together odd number of horseshoes. Weld together a three horseshoe coat hook by placing two horseshoes flat and side-by-side with the third one standing on edge. The horseshoe standing on edge is the coat hook. Add more horseshoes to make the coat hook rack longer. This is an excellent item to hang outside for drying herbs, flowers and garden produce.